If you simply have a small puncture in your vinyl siding, repair is easy. Use siding cleaner to clean the area around the puncture. Wipe the area dry with a rag. Cut the tip of your color-match vinyl siding caulk and fit the tube into your caulk gun. Squeeze the caulk into the puncture to fill the space behind the hole. Overfill the hole slightly, then use your caulk trimmer to scrape off the excess caulk. 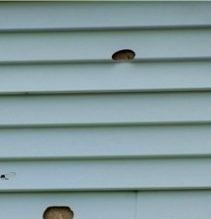 A hole or tear in your siding requires a little more effort to repair. Use siding cleaner to clean the area around the hole. Use your utility knife or shears to cut a scrap piece of siding several inches longer than the opening. Cut the top and bottom edges so you’re left with a flat piece of siding that curves on the top and bottom. Place the piece over the hole to make sure it fits and curves correctly. If it doesn’t, continue to trim the edges until it does. Apply a generous amount of caulk to the back side of your scrap piece of siding and run a bead of caulk around the hole opening. Place the siding piece over the hole and press firmly to seal. Let dry, then use a utility knife to cut away any excess caulk.